It's a place where time has stood still. It is a place where color and gray collide in dramatic harmony; where the calm sea under a bluebird sky bears little hint to the potential wrath that could be unleashed without warning. Its landscapes have inspired the artist; its climate has humbled the most experienced sailors. Yet those who know New England and its capricious coastline are reverent to it with fierce passion, and those who experience it for the first time are forever changed. 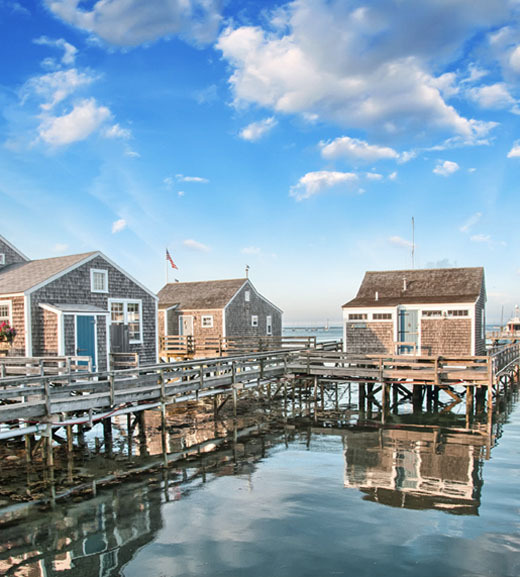 Extending from the northern tip of Maine south to Montauk at the end of Long Island, New York, the New England coastline is rich in maritime history and draws a host of visitors to its alluring cruising grounds each year. 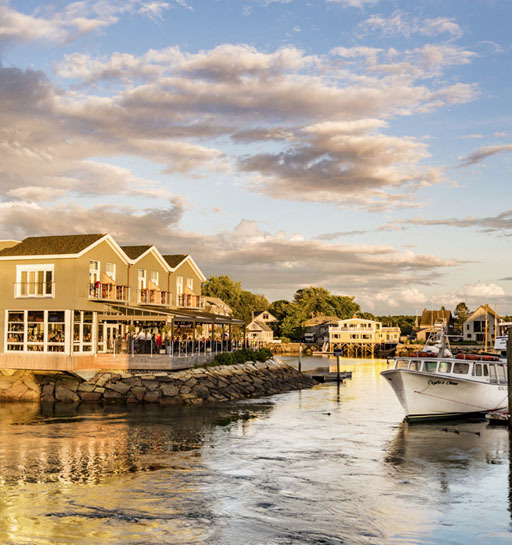 New England caters to salty sailors and the elite jet set alike; its charming coastal communities with boutique shops and ice cream parlors provide a relaxing respite from the hustle and bustle of today's technology-bombarded world. Fishing and lobstering still serve as a backbone of the region's economy, as does tourism in the popular summer destinations of Newport, Nantucket, Martha's Vineyard and The Hamptons. Stretching out into the sea from its perch on Aquidneck Island, the city of Newport, Rhode Island embodies all things nautical. Newport has long catered to sailors and yachties alike and its yacht-filled harbor has hosted America's Cup races and the renowned annual Newport Bucket regatta for years. While it's easy to spend an entire week in and around this lively and historic town, it's also a great place to either begin or end your charter. Tour a mansion or two. Do the Cliff Walk with its breathtaking views. Race on the famous 12-Meter sailing yachts. Indulge in a private clam/lobster bake at Rose Island. Brunch at the inimitable Castle Hill. Enjoy strolling the streets and exploring the wharfs that make up this special part of New England. The preferred summer retreat for the elite, The Hamptons offers luxury in a decidedly casual setting. Join an exclusive lawn party at a seafront mansion or meander along the coastline stopping to visit the charming towns along the way. Begin your journey at Sag Harbour near Greenport's Sterling Harbor, one of the most beautiful waterfronts on the North Fork. Visit the historic seaport of Greenport with its restaurants, art galleries and shopping. Enjoy paddleboarding, swimming and snorkeling, shell collecting and the natural beauty of the waters along Long Island. 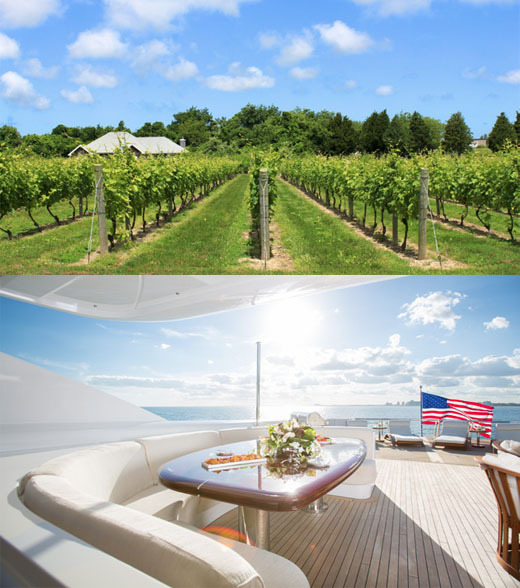 Visit a vineyard, dine on the best seafood on Shelter Island, stroll along the charming streets on Fishers Island, and catch one of the many summer festivals and fireworks displays from the comfort of the aft deck. From stunning mansions and historic sites to turtles on Robins Island, bike rides on Block Island, and serene parks in Montauk, Long Island and its Hamptons offer the quintessential summer experience. This tiny island off the coast of Long Island, New York and Rhode Island is largely undeveloped, which lends to its serene, laid back vibe. Known as a "barefoot and bicycle" kind of place, Block Island is known for its scenic rolling hills and dramatic coastal bluffs. 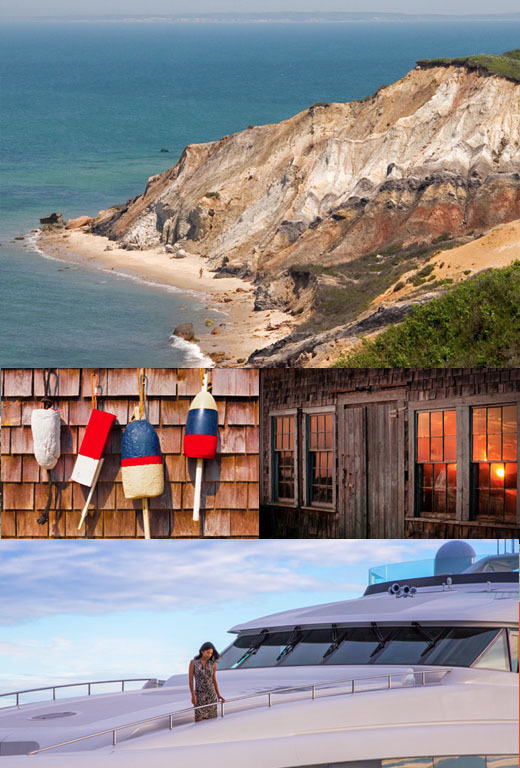 A day or two at Block Island can be just the adjustment you need during your New England charter. Rent scooters to circumnavigate the island. Stunning cliffs, sand dunes, and incredible landscapes on scenic country roads await your gaze. Tour the lighthouses. Jump in the ocean from one of Block's fabulous beaches, or have the crew take you fishing for striped bass. The best vista is at The Atlantic Inn; enjoy the sunset from the Adirondack chairs on the lawn. The island of Martha's Vineyard off the coast of Massachusetts has been a long revered summer vacation destination. Accessible only by boat or air, the island epitomizes the essence of New England in the summertime and as such will delight first-time visitors. Anchor or dock in Edgartown, nestled among some of the most gorgeous and expensive homes in the nation. 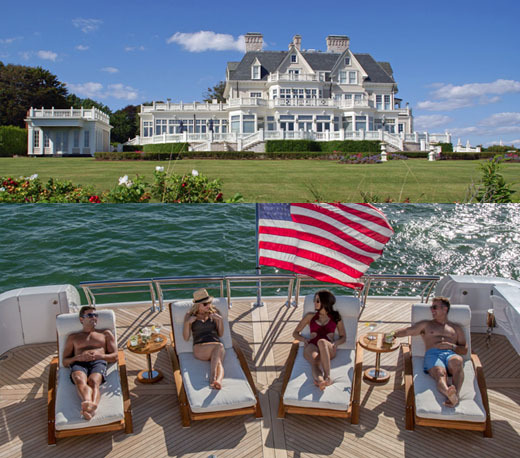 A harbor ride by tender is the perfect way to â€˜tour' these majestic homes. From clothing boutiques to art galleries, there's something for everyone in Martha's Vineyard, even if it is simply an afternoon ice cream or a bite of famous fudge from one of the many sweet shops. Renting bikes to take in Oak Bluffs is a mustâ€”each street is filled with brightly-colored gingerbread houses and the marina usually has some action from local and visiting fisherman displaying their catch. Once one of the busiest harbors, the now quiet town of Vineyard Haven is worth a visit, especially to The Black Dog Tavern for dinner. Rent Jeeps and check out the diversity of the island. Around every corner beautiful view ready to be captured by camera. The best sunset is at Aquinnah (Gay Head), complete with a lighthouse and multi-colored clay cliffs. This tiny island off the coast of Massachusetts is known for its charming ambience and air of exclusivity. Once a major whaling port, Nantucket's well-preserved cobblestone streets now lead to opulent mansions, antique stores, art galleries and quirky boutiques. Visit the Whaling Museum for a taste of local history or try surfing off one of the many beautiful beaches. Rent bikes and explore the Nantucket Boat Basin and the towns outside the hub of activity, all of which are accessible by a network of bike paths. 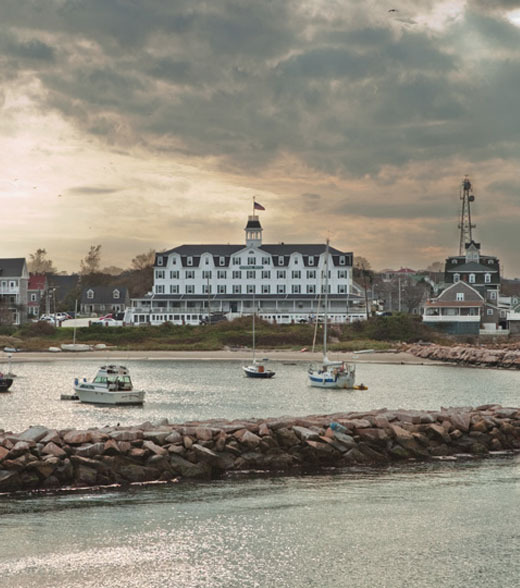 In the evening, enjoy stunning views of the harbor lights as you sample some of New England's best fish and seafood at the White Elephant Hotel's Brant Point Grill. Don't leave without a classic wooden floatable from The Toy Boat. Renowned for its cultural facilities, world-class educational institutions and champion sports franchises, Boston proudly bears its place at the very forefront of American history. Upon arrival, walk in the steps of America's historic figures as you explore the iconic waterfront and take in the sights that this vibrant and thriving city has to offer. Enjoy a serene Swan Boat ride at the Public Garden or a private, guided tour of the Freedom Trail. 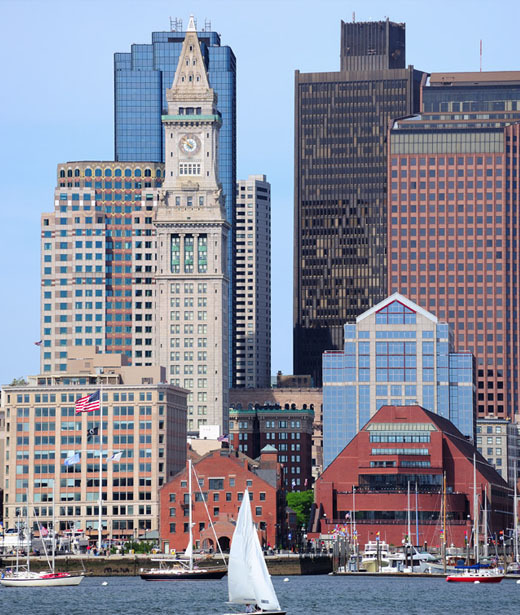 Peruse the shops, marketplace and dining options at Faneuil Hall and Quincy Market or take time to visit the New England Aquarium or soar to the top of the John Hancock building for stunning city views. Dining options are plentiful at Rowes Wharf while fabulous authentic Italian dishes can be found at many restaurants in the North End. If you are planning your charter around the 4th of July holiday, Boston is the place to be for the celebrations, fireworks, the Boston Pops and much more! Awake to the sound of a distant foghorn and the slow clang of a buoy during your late summer charter in Maine. Curl up with a cup of coffee and your favorite book on the aft deck as the cool fog slowly gives way to calm waters and blue skies. The most popular cruising route along this northern coastline runs between Boothbay and Mount Desert Island. Peruse gourmet markets and specialty shops in Portland or ride the Narrow-Guage steam train in Booth Bay. Visit Blowing Cave or Spouting Rock in Kennebunkport. Catch a glimpse of migrating whales, seals and eagles and enjoy al fresco luncheons of the day's fresh catch in quiet coves. Explore quaint fishing villages by bike and dine on fresh local fare at charming restaurants offering breathtaking seafront views.